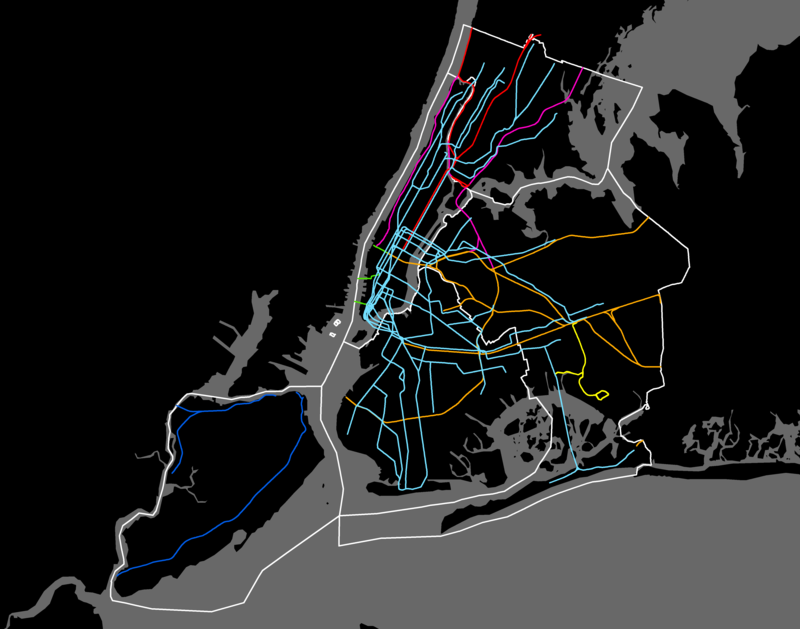 At @chrislhenrick‘s request, I’ve posted a link below to a zipped version of the NYC LION data set in shapefile format (which I explore further in my post below). 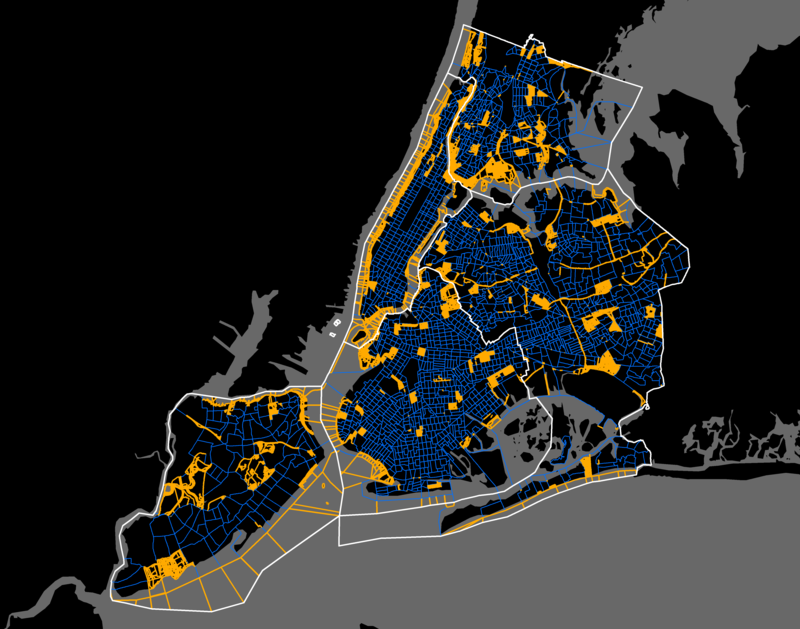 The NYC Dept of City Planning only provides an ESRI Geodatabase, which is native to ESRI software, therefore presenting a challenge to people using non-ESRI applications. Although the shapefile format is technically also proprietary to ESRI, it’s become a de facto open format, easily read/consumed by other software packages such as QGIS (from which you can simply “save as…”, for example, to almost any other format you want). Earlier this year our team at the CUNY Graduate Center worked on a project that involved extensive use of the NYC LION file. 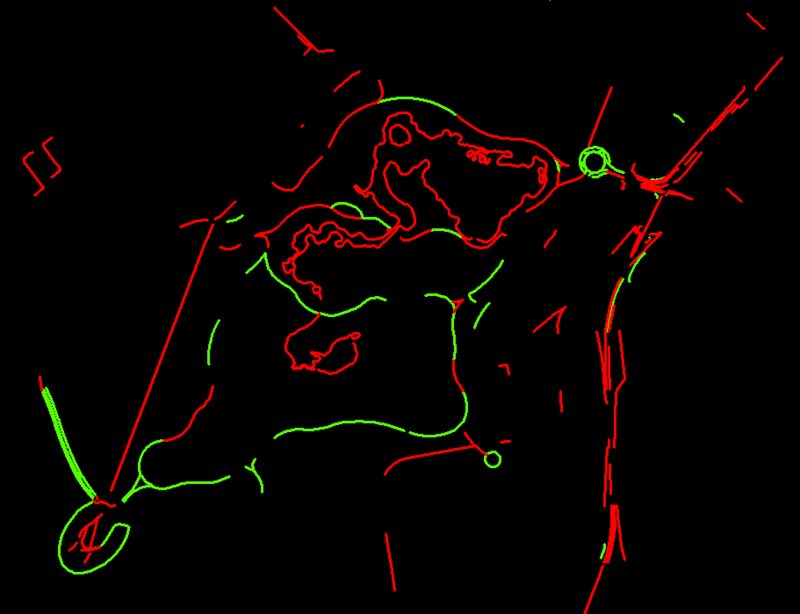 According to the metadata, “LION is a single line representation of New York City streets containing address ranges and other information.” The centerline GIS data, as well as the “other information” in LION, is pretty impressive, and this blog post highlights some of the really neat nooks and crannies in the data. LION-the-name is of a piece with TIGER, the US Census Bureau’s massive spatial data set of the nation’s street grid (and other Census statistical areas). Both are kinda (too?) cute “backronyms” – TIGER as shorthand for Topologically Integrated Geographic Encoding and Referencing files. LION stands for Linear Integrated Ordered Network, presumably pieced together to represent an equally fierce jungle animal symbolically showing that NYC’s street centerline data was just as impressive. LION is now part of the city’s newer City Street Centerline (CSCL) project, also an impressive effort but a much tamer string of initials – not even an acronym, and nowhere close to BEARs, which IMHO would’ve been the perfect Oz-like grouping (“LIONs and TIGERs and BEARs, oh my!”). 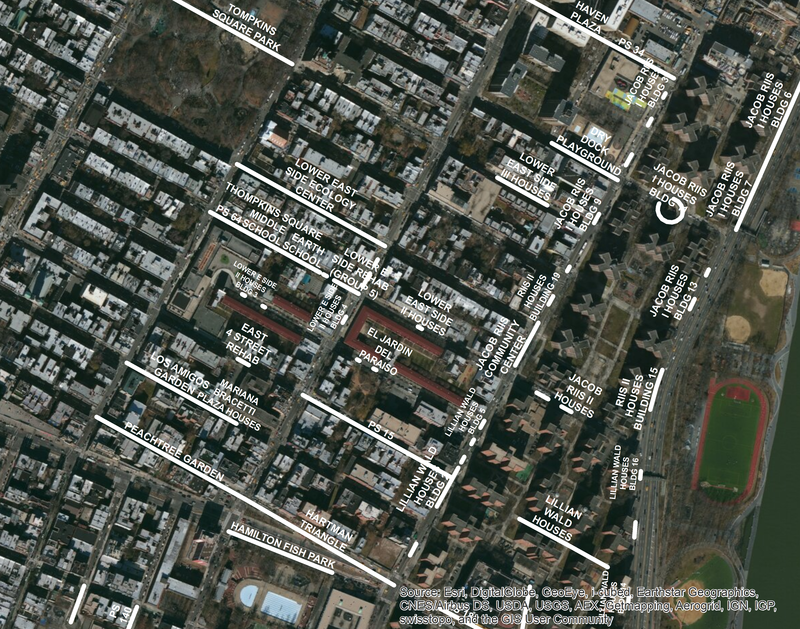 The LION file has been maintained by DCP [NYC Dept of City Planning] as a major component of the Geosupport System. 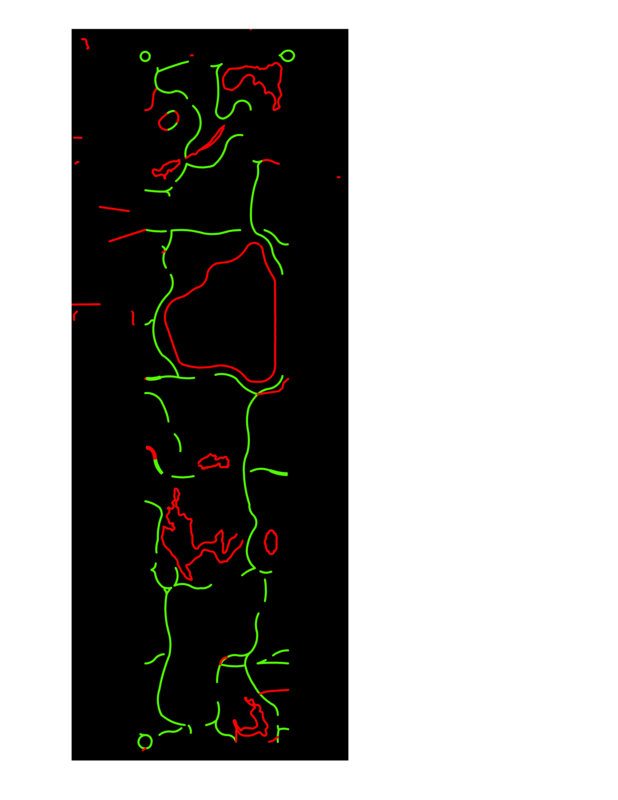 It is a single line representation of New York City streets containing address ranges and other information. 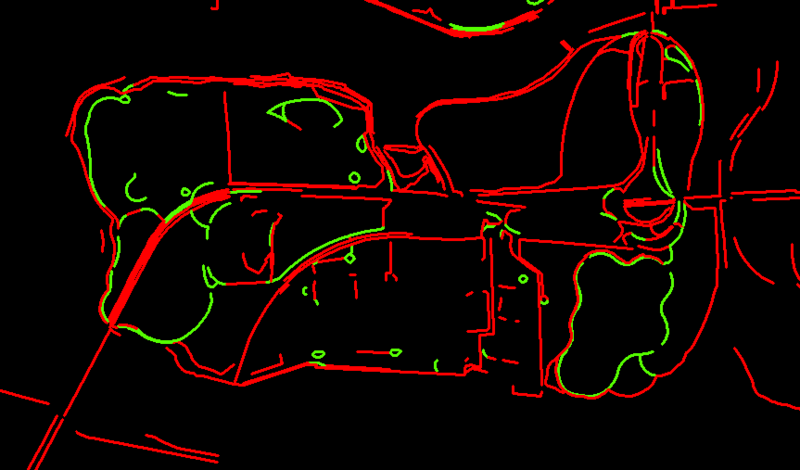 The LION file has also been used for automated cartography within DCP. 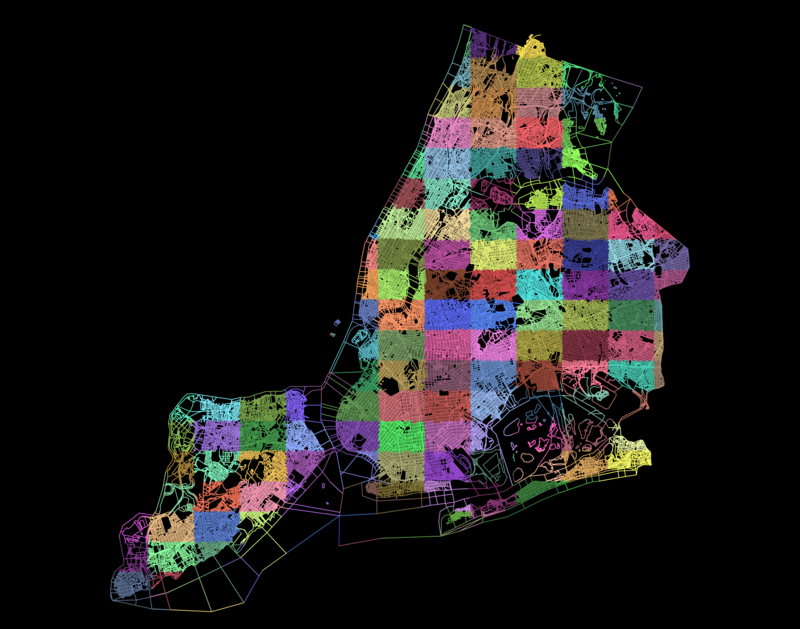 The increasing use of microcomputer-based mapping and geographical information systems within the City’s government has led to the development of the BYTES of the BIG APPLE™ files. In 1996, the LION dataset was spread over several files occupying 14 MB of disk space. The latest version of LION is available as an ESRI geodatabase occupying almost 130MB of disk space, almost 10 times as large. There were a number of attribute fields in 1996, but nowhere near the more than 100 fields available today. In this expanded set of attributes lies all sorts of fascinating ways of describing and representing New York City’s street system. Of course LION can be used to just display streets throughout the city. But there’s lots more in the file, not all of which is obvious. For example, LION has an indicator for curved vs. straight street segments, and whether the curve is “irregular” (i.e, not a circular arc) or if it’s a “circular arc lying on the left [or right] side of the segment’s directed chord.” Wow. The red lines are “irregularly curved segments”, the green lines are circular arcs — remember that the lines may represent multiple connecting segments, so even though a green line may not look like it’s part of a circle, each segment along the line may be its own circular arc. Note that you can click on each map image in this post to see a larger version. Also, the white lines above are borough boundaries as indicated by LION segments, based on the LocStatus field (where LocStatus is 1, 2, 3, 4, 5, or 9). Light blue are subway lines, yellow is AirTrain, dark blue is the Staten Island Railway, green is PATH, brown are the various LIRR lines in the city (including the Bay Ridge freight line), red is Metro North, and purple is Amtrak/Conrail. LION can be used to locate “non-addressable place names” (NAPs), or “geographic place names that cannot be combined with a house number to form an address” (per the City Planning Department’s Property Address Directory user guide [PDF]). 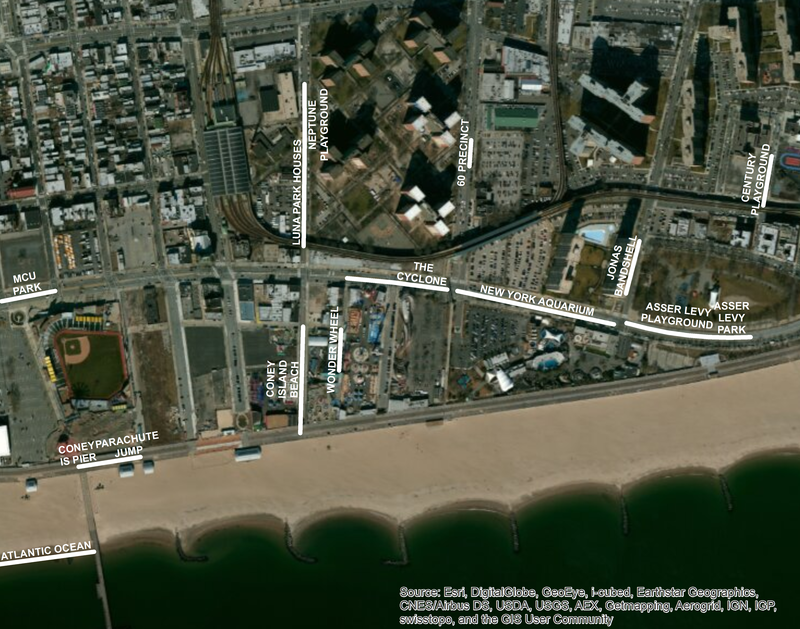 Examples of NAPs in the city’s street centerline file include the Empire State Building, Columbia University, or even the Coney Island Cyclone. Even though each of these locations likely has a street address, there’s no “25 Empire State Building” or “350 Columbia University”. The names themselves have been georeferenced by DCP so that the names alone can be used for geocoding and map display. … and I labeled the segments with the SAFStreetName field (described in the LION metadata as a “Special Address Place Name”). Some of the LION segments in the images above are very precise (such as El Jardin Del Paraiso, represented by a very narrow piece of the street segment along East 5th St). Others extend along an entire city block or more, such as PS 15 or New York Aquarium in the images above. LION includes more than street segments. It also includes line representations of borough boundaries (as shown in the highway/bridge/tunnel map above), administrative district boundaries (such as Police Precincts or Community Districts), and Census block and tract boundaries. The LION file also includes some history regarding the Census geography. 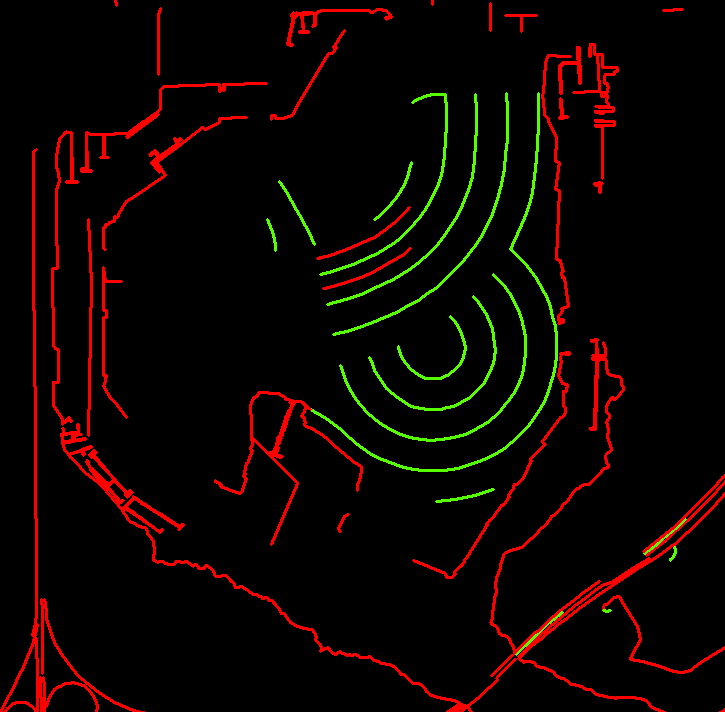 The latest version of LION includes attribute fields indicating which segments align with Census block and tract boundaries not only in 2010, but also in 2000 and 1990. These changes could’ve been simply due to different tract numbers from one decade to another, but also could’ve been the result of tract geometry being split or combined.